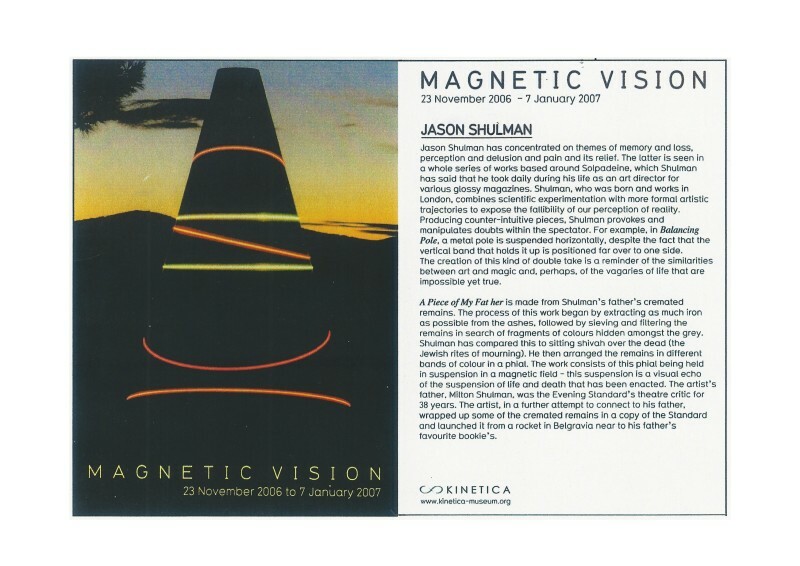 Jason Shulman has concentrated on themes of memory and loss, perception and delusion and pain and its relief. The latter is seen in a whole series of works based around Solpadeine, which Shulman has said that he took daily during his life as an art director for various glossy magazines. Shulman, who was born and works in London, combines scientific experimentation with more formal artistic trajectories to expose the fallibility of our perception of reality. Producing counter-intuitive pieces, Shulman provokes and manipulates doubts within the spectator. For example, in Balancing Pole, a metal pole is suspended horizontally, despite the fact that the vertical band that holds it up is positioned far over to one side. The creation of this kind of double take is a reminder of the similarities between art and magic and, perhaps, of the vagaries of life that impossible yet true.